Fay Triangle is a 4-small-lot-homes project located on Fay Avenue, just a few properties up from our Fay 2x and 3x Homes projects, and a mere 0.2 miles from our office. This property is a stone’s throw from Culver City, but because it is actually located in Los Angeles, it can take advantage of Los Angeles’s Small Lot Subdivision Ordinance. 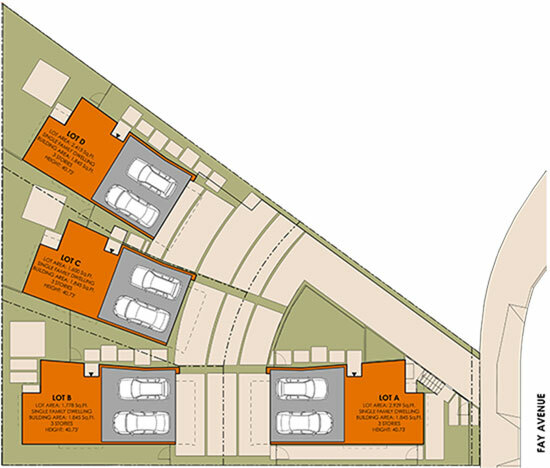 As an office, we have laid out site plans for small lots on hundreds of lots all over Los Angeles. But, the majority of these lots are rectilinear and relatively straightforward to lay out. But this lot is triangular! How fun! As a result of the lot’s unique shape, we were able to come up with a unique small lot project. Instead of fighting the triangularity of the site and insisting on an orthogonal site plan, we let the shape of the lot influence the placement of the homes. What results are four free-standing homes that fan out across the site, allowing for space in between the homes for circulation, light penetration, and access to views. The view from the upper floor deck is different for every home, as each home is rotated slightly away from the home next to it. There are views southeast to Baldwin Hills, southwest to the Helms Bakery sign, and northwest to Century City and the Hills beyond. 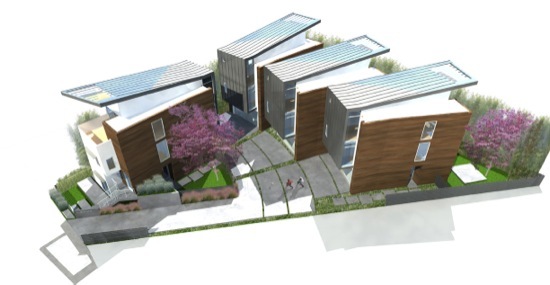 The Fay Triangle property gets its triangular shape from being wedged into the corner as two city grids collide: a residential grid into the commercial properties lining Venice Blvd. Because of its proximity to Venice Blvd., the lot has some unique neighbors with which to contend. To the south is a small neighborhood of small homes and apartments, to the north is an auto repair shop, and to the west is a small, two-story motel. The front home is sited facing Fay Avenue, with a front porch that engages the street. A new property wall. a hedge, and a driveway into the site separate the homes from the auto repair shop. The three rear homes each have a private backyard. To control the views into the yards from the motel, and keep the motel out of site from the yards, a buffer of tall bamboo is planted along the north and west property edges. A small fountain is located in each home’s entryway, masking any noise coming from Venice Blvd. Each of these thoughtful design moves helps to create a small cluster of homes, that from the ground floor you would never suspect you are so close to a major boulevard. Yet, from the upper floor living spaces, you are able to look over and beyond the commercial activities around you and enjoy the views. This will be our sixth project within a mile radius of our office, advancing our commitment to this Culver City-adjacent area. Check out a map of these projects we included in a recent blog post.